The official sticker collection of the French Ligue for the season 2014-2015 is issued as usual by Panini and it includes all the clubs of Ligue 1 and Ligue 2. The style of the stickers follows the collection Panini Calciatori (Italy) of the year before: stickers have yellow border and club badges are in fabric material. The album starts immediately showing the Ligue 1 teams without introductory stickers. Teams are showed in alphabetical order and are displayed over 4 pages. Each team has 24 stickers plus a maximum of 4 update stickers. There is a special fabric club badge, a team photo (two stickers), the coach, and 20 players. Two of the 20 players are special stickers: the top player (gold shining sticker) and the rising star (silver shining sticker) of the team. The update sticker set includes 30 new players and it was released in April 2015. 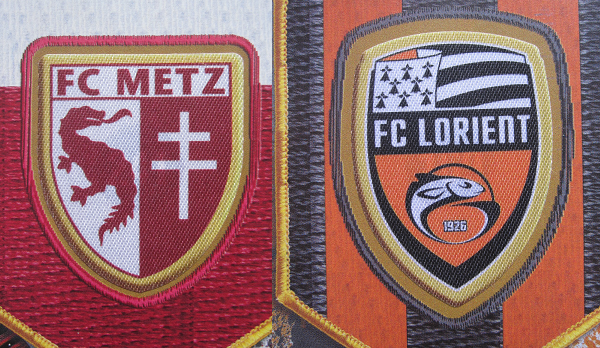 Ligue 2 teams are shown right after the Ligue 1. The section opens with the calendar of the season on the left and the first two teams on the right page. Each team is shown on half page and includes the club badge in fabric material (half sticker) and the team photo (one sticker). Details about the squad, statistics, and the team jersey are included. The season 2014/2015 just ended with the victory of PSG (83 points) in front of Olympique Lyonnais (75 points) and Monaco (71 points). Lacazette (Olympique Lyonnais) was the top scorer with 27 goals. Evians, Metz and Lens are degradated to Ligue 2 and they will be replaced by Troyes, Gazelec Ajaccio and Angers. In Ligue 2 degradation for Orléans, Chateauroux and Arles and the new enters from the National Ligue (and thus expected to be present in the Panini Foot 2016) are Red Star, FC Boug-Péronnas and Paris FC. As a curiosity, two new teams of Paris area (Red Star and Paris FC) will be thus in Ligue 2 next season. In this season we have discovered some interesting prospects. 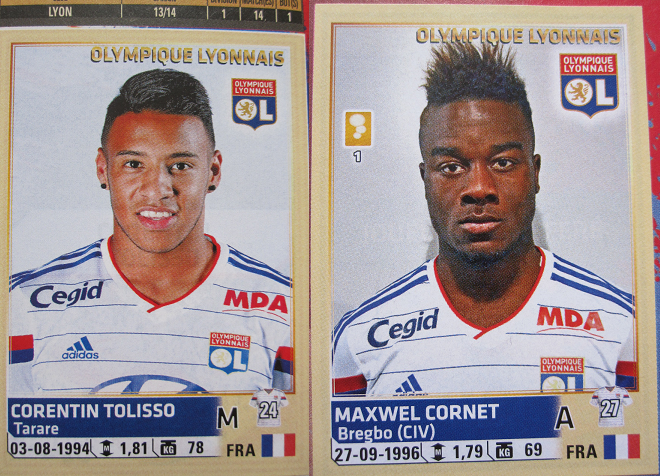 In Lyon, Fekir (1993) and Tolisso (1994) are already key players, whereas the new transfer Maxwel Cornet (1996) has played his first match in Ligue 1. 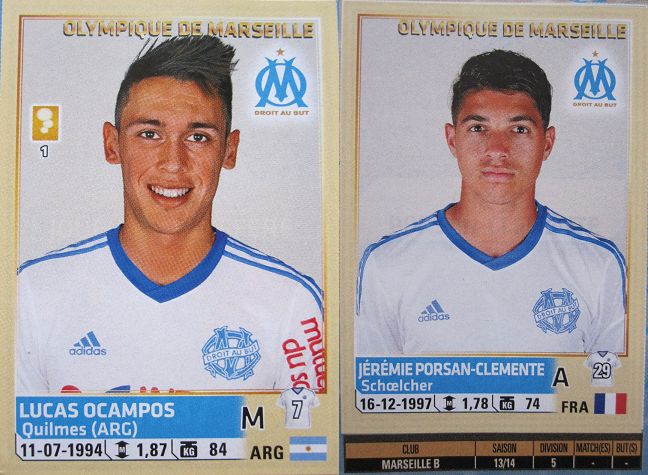 Olympique Marseille has a young squad, here we find Jérémie Porsan-Clemente, the youngest player included in the album. 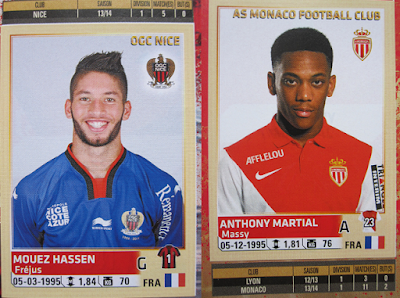 Anthony Martial is the great hope of French football as he played regularly for Monaco this season and scored 9 goals. Tolisso (38 appearances and 7 goals) and Cornet (4 appearances) for OL. Ocampos new transfer from Monaco scored 2 goals for Marseille. Porsan-Clemente (born 16-12-1997) is the youngest player of this album. Hassen (Nice) is a young goalkeeper who played regularly this season. Martial (Monaco) scored 9 goals in Ligue 1 for Monaco. The club badges of this albums are special fabric stickers, a great feature of this album.